Upon arrival after a four week journey, the Moving On symposium investigates wayfaring as an artistic and spatial practice. 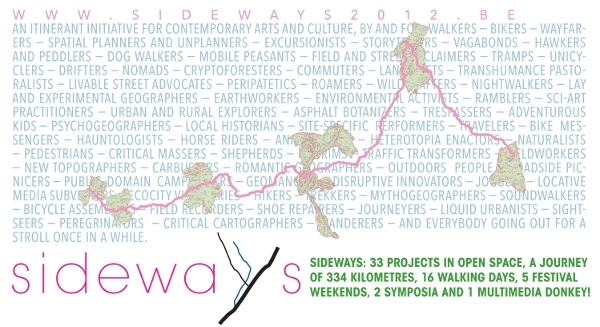 Sideways is a translocal, experimental festival for contemporary art and cultural research, exploring non-motorized paths and trails folded into the spaces of everyday life. This first-time event unfolds ‘in the open’ and ‘on the go’. The backbone of the festival is a 4 week expedition on foot through Belgium, from West to East, between August 17th and September 17th 2012. In resonance with the artistic program, the Moving On symposium provides a collaborative meeting ground at the crossroads of contemporary art, the study of mobilities and sustainability, experimental geography, spatial praxis and urban or rural activism. Far more than a physical trace inscribed on the earth’s surface, a path or trail is tantamount to a movement, an act of crossing, the performance of the passage or the journey. 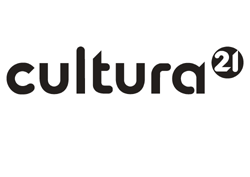 As a location for encounter and exchange, the path occurs as a nexus of symbols and meanings, memories and stories, a site where events unroll and subjectivities emerge. The Moving On symposium focuses on the socio-cultural and ecological aspects of being on the go. It explores the ways in which everyday paths and trails can be used as a challenging environment to address issues regarding mobility and landscape, as well as to expand notions of what art can be. In this context, walking is heralded as a creative, expressive tool that acts as a filter and catalyst to our interaction with the environment, a tool to read and transform our surroundings. Tim Ingold expands upon the relation between what he calls the meshwork and the atmosphere, or between lines and the weather. In a ‘serendipedestrian’ talk, Sacha Kagan questions how walking can foster aesthetics of complexity and processes of sustainability. Jan Masschelein presents walking as an educational device to enter the world, based upon experiences in post-conflict cities, non-tourist megapoles and quiet rural cities. Elke Van Campenhout presents the a.pt research program (advanced performance training) and links it to the mobile Sideways laboratory. The disruptive walkers of Wrights & Sites contribute a lecture-performance relating to the Ambulant Architectures toolkit they have been experimenting with throughout the last week of the Sideways journey. Baptiste Lanaspeze takes us along the Marseille Metropolis Hiking Trail, a long-distance trail beyond the urban-wilderness divide to be inaugurated as part of the Marseilles European Capital of Culture in 2013. Giulia Fiocca (Stalker) shares experiences of walking across and mapping in common the changes of the contemporary post-urban territories in Rome, Italy. Dirk Sturtewagen talks about the collaborative Slow Mail project: the writing of letters that will be conserved for 18 years, only to be opened by the next generation. Martin Kohler introduces a series of urban walks through some of the world’s largest urban agglomeration (São Paulo, Seoul-Incheon, Istanbul, London, etc.). Geert van Waeg explains how roads that offer no exit for through motorized traffic are turned into living end streets. Wim Cuyvers presents the video essay “3 walkers” in which he dives into youth memories to explore the meaning of walking. In collaboration with the Sideways festival, the Walking Artists Network (www.walkingartistsnetwork.org) presents Walkie-talkie too – a day of scratch walks and peripatetic perambulations. Walkie-talkie too is established in order to aid/enable/force those who use walking in their practice to come together and think and talk and walk. All are welcome, however everybody does her/his own walking – as an artist, commuter, ecologist, geographer, hiker, historian, urban planner, or just for the pleasure of it – please come along and add your feet and thoughts. There is no pre-defined content or agenda beyond the goals of connecting with fellow walkers and sharing ideas. The day unfolds as a series of ‘open-space’ workshops to identify a range of themes, points for discussion and areas of common interest. These topics are then taken out for a walk, after which participants regroup to document and share results. The morning part of the Moving On symposium proposes a series of lectures tackling topics of art, walking, sustainability and learning. Subsequently, invited speakers engage into a panel forum that extends upon questions that emerged out of the different lectures and throughout the global Sideways experience. The afternoon part of the symposium takes the form of an outdoor trail, connecting different intervening speakers. Each symposium participant of the afternoon slot narrates a more practice-driven approach and is linked with one or more of the Sideways artists who have joined (part of) the Sideways expedition. Each ‘couple’ will be situated at a particular spot along the symposium trail and the public will be free to roam around the area and to exchange with the different speakers. The trail will be ‘active’ for about 2 hours, so the public can join different speakers for a variable timespan. Speakers will have their basic story to tell, but it will alter, evolve and transform, as passers-by come and go, bringing new insights, questions and experiences. The symposium day will be concluded with a round-up meeting and discussion. Sideways moves beyond the conventional spaces of research and art display. Fairly removed from Belgium’s metropolitan arts centres and academic strongholds, the Moving On symposium is hosted at ‘De Lieteberg’, one of the gateways into the National Park ‘Hoge Kempen’ (www.nationaalpark.be). The most convenient way to reach the Moving On venue by public transport is to take the train to Genk station and continue by bus to the town of Zutendaal. For train times please check the website of the National railway service Belgium (www.belgianrail.be). Bus services to Zutendaal (line 45 direction Maastricht) depart from in front of the train station in Genk. Get off at ‘Zutendaal Kerk’ and walk to De Lieteberg (see the map on www.sideways2012.be). On Saturday 15th of September 2012, Sideways also organises a direct shuttle bus between the Genk train station and De Lieteberg. The language of this event will be English. Free admission. Limited seating. Please register in advance on the website or by email to sinta [at] sideways2012 [dot] be.